When creating multiple virtual machines for a new XenDesktop Machine Catalog, I noticed that the wizard wasn’t honoring the templates hardware boot order. New virtual machines started up and gave us an error saying they were not found in PVS. This occurred because they were booting from the wrong NIC and this MAC address was not configure on the target device in Citrix Provisioning Services. Our virtual machines have 2 NICS, 1 for PVS streaming and 1 for Data. 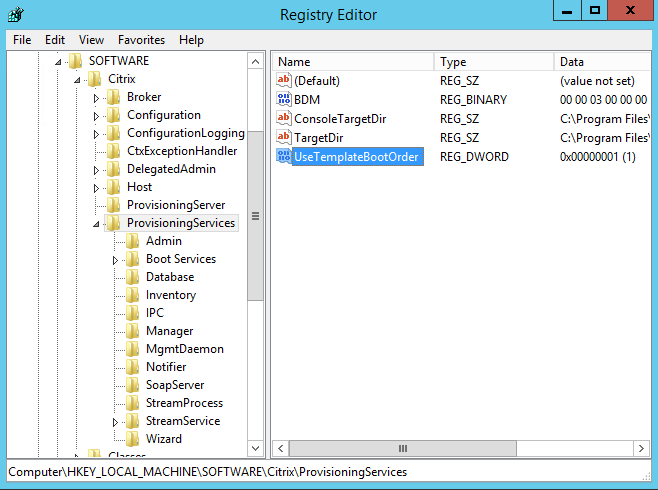 To correct this issue you need to add the following registry keys on your Citrix Provisioning Servers. The Streamed Virtual Machine Setup Wizard does not honor the template boot properties when creating targets. Right Click on ProvisioningServices >New DWORD (32-bit) Value.